Governor Terry Branstad joined Republican legislators Thursday to talk more about their economic proposals for the next legislative session that they first introduced in August. “If you’re going to talk about a strong economy, you need a competitive tax code…just like we’ve have attempted before, but now unified the whole group of us, we’re going to address property tax reform and relief, ” Paulsen said. 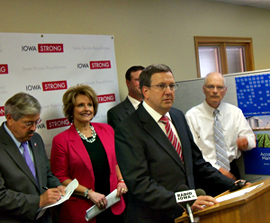 Branstad would not nail down specifics of how big a rollback Republicans are envisioning for commercial property taxes. “We are not revealing the details of this today, but as you know, in the last two years the House has I think on four different occasions, passed property tax legislation that would reduce property taxes. Senate Democrats have failed to pass it, Senate Republicans have tried,” Branstad said. The governor said they will fully fund the state commitment to fully funding the school funding formula and the tax credits for local governments to overcome the rollback in commercial property taxes. And he said they want to limit all classes of property taxes so there is no shift of the tax burden from one to another. 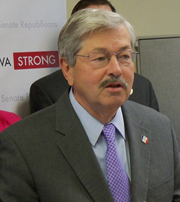 “And at the same time, gradually reduce the property taxes on commercial and industrial and provide a state appropriation to local governments based on the losses that they would see from the commercial property tax to offset that so they will be held harmless and protected from any reduction in revenue,” Branstad said. The governor has talked about the potential of raising the gas tax with an offset of other taxes, but backed away from that Thursday. “We’re not addressing that no. I guess the answer to that is, that is not one of the issues we’re choosing to focus on. And I think that’s an issue I’m sure that individual legislators will look at but frankly, I think these are the issues that we think need to be focused on at this point in time,” Branstad said. Governor Branstad said their economic plan also includes efforts already underway to reduce red tape and regulations to make it easier to start a business in the state. And he said they will work to increase career opportunities by investing in a skilled and competitive workforce through a coordination of efforts by the various levels of education entities in the state. Republicans said they will release even more details on their joint plan later, but said it is important to win majority control of the Senate in November to push their plans through.